While I am a blogger by night, I’m currently a copywriter working in a cubicle by day. What’s the toughest part of my job though? Sitting in that cubicle for 9 hours 4 days a week! Let’s face it, job fatigue is an epidemic problem in this country, and millions of people get sleepy at work, face neck and back pain, and feel other signs of malaise when they are working inside of a cubicle. Sitting at a desk typing for hours on end is a sure way to induce many medical maladies — including neck and eye strain, soreness in the hands and legs, and even carpal tunnel syndrome. #1 Go for a walk around the office. I get up out of my chair every 30 minutes or so and walk around the office. During this walk around the workplace, I may do a little bit of multi-tasking and use this as a chance to get a refreshing cup of water over at the cooler (I always aim for drinking eight glasses of water each day), or perhaps shoot the breeze with a coworker or two to see what’s going on in their lives. But wherever I venture in the office, I make sure I move around enough to get my blood flowing, get my muscles moving, and give my body a chance to get away from the chair. It can even help me lose weight or maintain a healthy weight. #2 Listen to music while you’re working. It’s not hard to get tired at work, especially in a writing role, where creativity comes in ebbs and flows. So, when I just can’t seem to think of what I want to write, my mind may shut off, lulled by the lack of creative spark. How do I keep myself from nodding off at the desk? I plug in a set of headphones and stream some music on the online feed from my favorite radio station – or bring along a headset and jam to some songs that way. Not only does listening to music help to keep me awake, it sometimes sparks enough creativity to eliminate the amount of white on my Microsoft Word window. Every now and then, I turn my cubicle space into a miniature workout room. Well, sort of. 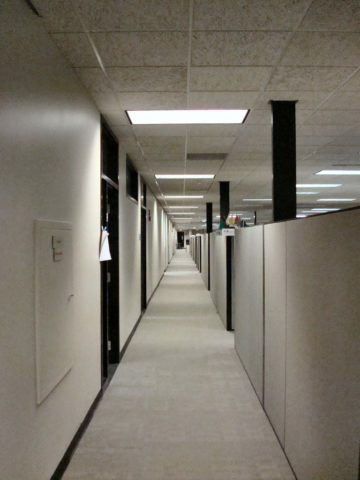 My 6-foot by 6-foot cubicle space is just large enough for me to push my chair up against one partition and stretch out my back, legs, and arms. I will lean my arms against my desk work surface and stretch my legs behind me as far as I can, in a lunge-style position. Then I will arch my back and move it around while still leaning against my work area. This is usually followed by standing up and reaching my arms for the ceiling, as if I were trying to grab for the fluorescent lighting flickering above my head. #4 Break up lunchtime if you can. I’m fortunate to have a 1-hour lunch break each work day. However, I learned that my body and my mind may be better off by breaking these 60 minutes up over the course of the day. That’s why, on many days, I will choose to divvy up my day into 3 breaks: a 30-minute lunchtime (during which I eat either a health-conscious meal that I brought to work or healthy fast food) around the middle of the work day sandwiched by two 15-minute reprieves – one in the mid morning and the other during the mid afternoon. Getting away from my desk for 3 prolonged periods instead of just one not only gets my derriere out of the chair more frequently, but it also helps to break up the monotony of my work and can even make the day seem to go by more quickly. Another idea would be to join your workplace’s gym, if it has one. There are many creative ways to beat job fatigue, and with a little thinking outside the box… er, cube… you could soon be on the way to feeling less tired at work and more enthusiastic about your job.